Citibank ThankYou Points (TYPs) are a type of rewards point that Citibank offers on their ThankYou rewards credit cards and checking accounts. I personally don’t value TYPs as high as the Chase Ultimate Rewards (UR) points, but they are still a form of currency and can be valuable when redeemed. I’ve earned quite a bit of TYPs over the last 6 months, since I was under a promotion through Citibank that gave me 5 TYP per $1 spent. Citibank TYPs never expire, and can be used to redeem anything from gift cards, to statement credits, to cash back, to mortgage payments, student loans, electronics, toys, books, discounts off airplane tickets and much more. No matter what, DO NOT redeem your TYPs for statement credits or cash rewards. It's simply not worth it as each TYP is devalued by 50%. When you redeem your TYPs for a gift card such as an Amazon gift card, 2,500 TYPs earns you a $25 Amazon gift card, which values each TYP at $0.01, much more valuable than statement credits or cash. Today I will talk about how to redeem your TYPs for mortgage payments. This is one of the few ways that a TYP can be redeemed for a value of 1 TYP = 1 cent. Other ways of redeeming TYPs at a 1:1 rate include gift cards and student loan payments. My biggest gripe and annoyance with the Citibank ThankYou program is that you cannot directly exchange your TYPs for 1 TYP = 1 cent cash or statement credit like you can with the Chase Ultimate Rewards program. The only TYP redemptions at 1:1 are for mortgage payments, student loan payments, or gift cards. In order to redeem for TYPs for greater than 1:1, you can use a premium ThankYou credit card such as the Citi ThankYou Premier card. This is achieved with purchasing airline tickets at 33% increased value of each TYP. I have no interest in that card currently since it has a $125 annual fee and I choose to pay annual fees on my Chase credit cards (for now). It's a credit card I may explore in the future. I decided to redeem 100,000 TYPs for a $1000 mortgage payment check made out to Wells Fargo. Redemptions start at 2,500 TYP for a $25 mortgage payment check. You can’t redeem this online and need to make a phone call to Citibank at 800-842-6596. I called and spoke with a customer service rep, provided the name of my mortgage lender, and my order was processed. I was told that I would receive the mortgage check made out to my lender in 2-4 weeks. The check is valid for 90 days, and is my responsibility to send it to my mortgage lender. The process was extremely fast and easy. Now if you don’t have a mortgage lender or student loan repayment, you can still request such redemptions made out to your bank. You can then deposit the check into your bank under your own account. For example you can have the check made out to Chase Bank. When you receive it, you can put your name and account number on the check, and then deposit the check into the ATM. Note: I have not personally done this – you may want to start with a small amount to test this out. But I’ve heard repeatedly that this is one way to redeem TYPs for 1:1 payout. You can read more about this process in a Fatwallet thread here. It’s a long thread but there’s a lot of relevant information in the more recent posts. 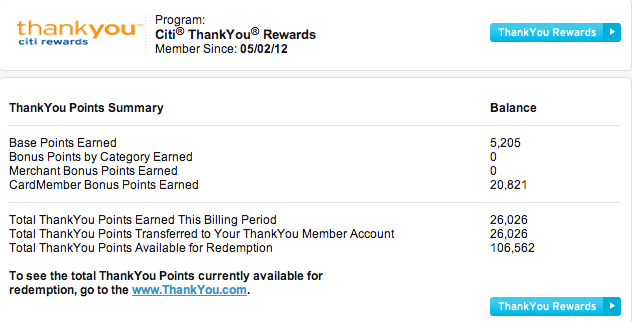 In summary, with Citi ThankYou points, it’s best to redeem them for at least 1:1 value (1 TYP = 1 cent). This can be achieved by redeeming your TYP for mortgage payments, student loan payments, or gift cards.